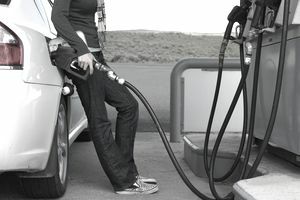 Whether you’re looking to reduce your carbon footprint because you care about the environment or to pull up at the pump less often in order to save money on gas costs, you may be considering making your next vehicle purchase a more fuel-efficient one. But you don’t want to sacrifice for safety or quality, either. Well, you’re in luck. The market for hybrid, electric, and fuel-efficient vehicles in a variety of sizes has never been better and more competitive. Because we know you’re not made of money (and if you are congrats! ), all of these vehicles offer excellent fuel efficiency at an affordable price point. Every single one of these seven vehicles gets at least 43 miles per gallon on the highway and comes with a price-tag of less than $30,000 when you choose a model with standard features. And because we know some of you are tall (or have tall passengers), we made sure to steer relatively clear of vehicles that scrimp on headroom or leg space. If you’ve been looking for a reliable, safe, and fuel-efficient car in the past few decades, you’re probably familiar with the Honda Accord. This midsize sedan comfortably seats 5 and comes with great fuel economy. However, some drivers report the engine can get noisy at high speeds and that the touch-screen system is hard to use. If you live in a crime-ridden area (or park in one often), beware: the Honda Accord often tops the list of most-stolen cars, too. If you just have to have an SUV (albeit a subcompact one), whether, for toting skis or children to and from soccer practice, the Kia Niro is the vehicle for you. It drives incredibly smoothly with a dual-clutch automatic transmission and has roomy seats that even your tallest friends will appreciate. The Chevy Malibu is one of the most well-rounded hybrid vehicles on the market. Although it has a smallish trunk, there is tons of space elsewhere in the vehicle, not to mention top-of-the-line safety features. The Fusion handles well and is fun to drive, but taller passengers might find out the hard way that it is a little tight on headspace in the backseat. It takes curves and uneven surfaces like a champion and can easily pass slower vehicles on the highway, and has excellent safety ratings to boot. I mean… is any list of small, cheap, fuel-efficient cars really complete if it doesn’t mention the Toyota Prius? If you’re looking for a compact car that still comes with ample cargo room (though maybe not the biggest seats), look no further than the Prius. It can’t accelerate super quickly (unless you put it in Sports mode), but this new compact car packs a serious punch in fuel efficiency (and not on your wallet). Just like any other hybrid, it can also run on electric rather than gas power if you’re idling and comes standard with many safety features as well. While the Prius may still have a slight advantage in terms of safety rating, the Ioniq has a sleeker interior and infotainment system. If you’re willing to take the plunge and purchase a fully electric vehicle (go hard or go home, right? ), the VW E-Golf might be for you. Don’t be fooled by its source of power: it can nimbly spring from zero to 60 MPH in fewer than 10 seconds and can make it over 100 miles on a single charge. The interior is amazingly sporty, and with zero emissions, what’s not to love? Best selling cars in the world.